Raves From a Special Bordeaux Vintage and Two Valentines Recipes | What Goes with What? With the 2018 harvest all safely in tanks and barrels wine makers and their staffs are on vacations or at least on short weeks as the whole process starts again soon with pruning and field prep. It’s a slow time in the industry and not much to report, except for the wonderful news from the fine folks that grow and make wine in Bordeaux. I offer two recipes for Valentine’s Day, a meatball with mortadella mixed in that’s cooked in a lovely, rich tomato cream sauce making it a nice shade of pink to help you celebrate, try with a Pinot Noir that likes tomato. There’s also a bitter sweet chocolate tart that should be a fine dessert treat. Enjoy! Monsieur Ronan Laborde of the Chateau Clinet in Pomerol is the incoming President of the Union des Grands Crus de Bordeaux, the premier organization of Bordeaux wineries. Of 134 chateau members, 100 were present and pouring samples of the amazing 2016 vintage in San Francisco recently. 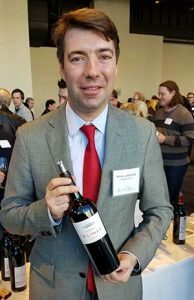 Laborde who is 39 and rather young to be appointed to such a prestigious position has only been in the wine business for 16 years but says he became his father’s in house sommelier at age 14 or 15 and developed a passion for wine. He explained that, “We have been very optimistic since the harvest as the grapes were very tiny with a high concentration of tannins predicting long-lived wines”. I asked for his reaction to the excellent scores (lots of high 80’s, 90’s and 100’s) for the vintage and rather than jump on the ratings bandwagon he commented, “It is not only the scores but how people react – we’re enjoying many smiles on the tour”. As to pricing he was a tad vague saying the there is a sensitivity to start out charging too much and then having to reduce prices to make sales so he suggested that he’ll let the market decide. I’m thinking you may see Monsieur Laborde run for the French presidency one of these days. The 2016 Bordeaux is an outstanding vintage. It is going to go down as one of the better vintages in history. The Left Bank, especially in the northern Medoc excelled. The Cabernet Sauvignon dominated wines (more Cab, less Merlot) are surreal. But, there are also numerous Right Bank vineyards (more Merlot less cab) that also made great wine. Most of the wines I tasted share some common traits; a great depth of color, they are inky and dark, very complex and display a lot of sweet fruits. The wines are tannic and will need cellar time. Bottle pricing at the high end chateaus will be steep even though they may still be a comparative bargain. 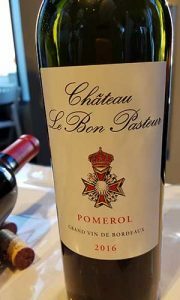 I found that many of the lesser-appellations in the Haut-Médoc, Fronsac, Francs Côtes de Bordeaux, and Castillon Côtes de Bordeaux got to make really interesting wines in 2016 that are at reasonable prices. The following are a select few of many that that I found to be quite good. The Belgrave is from the secondary region I mentioned earlier. And for some selections a bit closer to home look I think you’ll enjoy these wines. I didn’t do the Gallo reference on purpose but mostly to show that they are everywhere and not in a bad way. Eat and drink well my friends and Happy Valentines to all. That’s my whine and I could be wrong.